Thank you so much for the connection. I have been in contact with the person and she is sending the mouse. What a great concept you have, quite clever. There is a zebra, a tiger, a elephant and a mouse in the series. If you want to bring back some old memories, Susie found a site where you can watch and download the original Saturday Morning Cartoons Beech-Nut commercial, which has these striped animals in it. Now we need to find the GREEN STRIPED TIGER that Phyl is looking for. 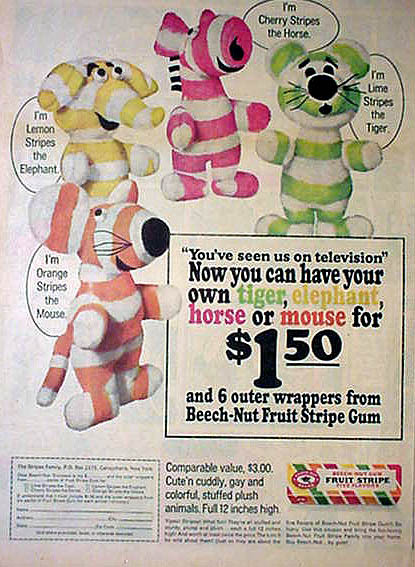 I’m looking for a green striped stuffed animal from Beech Nut Fruit stripe gum. I’m sorry I don’t have a photo. 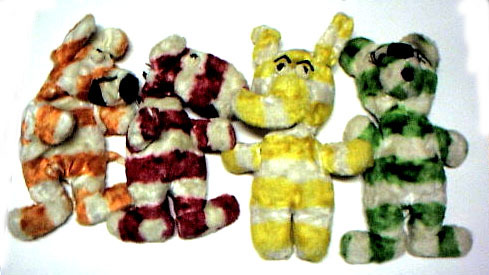 These were stuffed animals maybe in the 60’s for Fruit Stripe Gum. There were 4 animals…a zebra, and maybe a horse and an elephant. I know my green (lime) striped one was a tiger. I named him Toenail, and he spoke thru me in a funny voice. I would love to find another. Susie has emailed me to ask for help finding the Orange Striped Mouse in this series. She writes:. I believe there were four animals to choose from when you sent in your money and the gum wrappers. 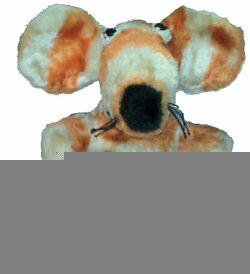 Mine was an orange stripe mouse with big ears that had wire in them so you could shape them. I ran your search, Sonya, but I could not find it. That’s it, Michael. Were these for sale? I’ll get the photo regardless. They wern’t for sale, they’re from a website that has pictures of vintage cereal boxes and premiums. Thanks for the page Michael. I think she would enjoy knowing their names. #060808-4: I am not certain if Phyl was successful in finding his green tiger but I have all 4-striped animals, in the original boxes, from 1965 from Beech-Nut Baby foods in New York. I am looking to sell all of them, and would like to know if you are interested. Just saw your post and was wondering if you still have any of the striped animals for sale and how much? Yes, we still have the mouse, horse and elephant in original packing. $40/each. Let me know. Hi I just found this post in a search. Is the elephant still available? Hi. I’m looking for the tiger. If anyone still has one I would be very much interested!!! Thanks!!! Do you still have the orange stripe mouse? This was my brothers favorite toy from that time. I would like to find one for him for his birthday. We have sold all but the red and white horse from the 60’s Beech Nut Gum collection. So please keep us in mind if anyone is looking for it.